Mónica Oliveira is Senior Lecturer in the Department of Mechanical & Aerospace Engineering in the University of Strathclyde. She has a PhD in Chemical & Process Engineering from Heriot-Watt University (Edinburgh, UK), and a degree in Chemical Engineering from the Faculty of Engineering of the University of Porto (Portugal). She became interested in complex fluid flows and rheology during her postdoc in the Non-Newtonian Fluid Dynamics Research Group at the Massachusetts Institute of Technology (Cambridge MA, USA), after which she returned to the University of Porto to join CEFT (Transport Phenomena Research Centre) where she held a research position until 2012. Her research focuses on fluid flows and transport phenomena, in particular the rheology of complex fluids, non-Newtonian fluid dynamics and microfluidics. 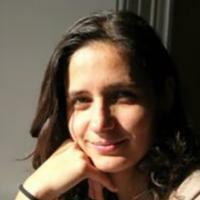 Mónica Oliveira publishes her research results in leading international journals including Physical Review Letters, Physics of Fluids, Microfluidics & Nanofluidics, Soft Matter and Journal of Fluid Mechanics. She is a member of both the Society of Rheology of the American Institute of Physics, and the British Society of Rheology. Korea-Australia Rheology Journal 28: 1-22. Zografos K and Barber RW and Emerson DR and Oliveira, MSN. Microfluidis and Nanofluidics 19: 737-749. Haward, SJ and Oliveira, MSN and Alves, MA and McKinley, GH. Physical Review Letters 109, 128301. Complex fluids are ubiquitous in nature and in industrial applications. Examples include biofluids, like saliva and blood, polymer solutions, dyes, paints and surfactant solutions. 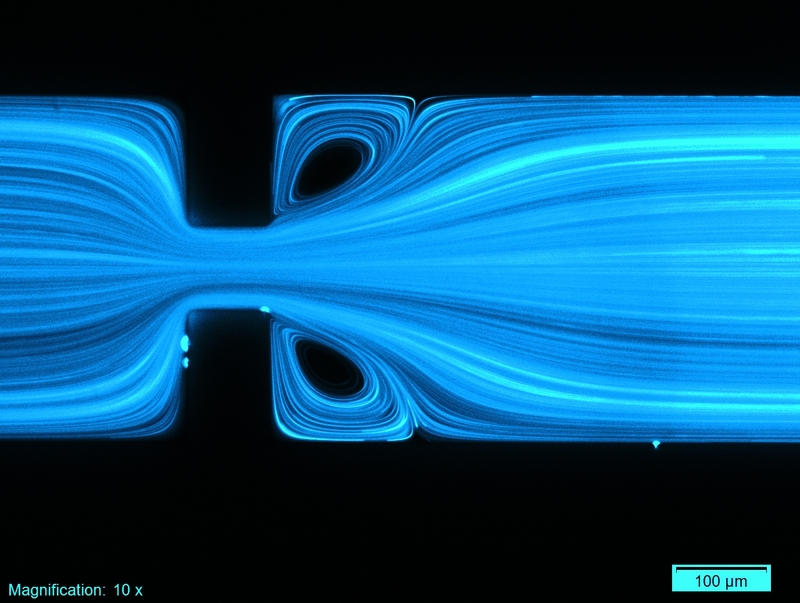 The nonlinear rheological behaviour of complex fluids imparts a rich set of unusual characteristics to their flows, which we are investigating through complementary advanced experimental techniques (e.g. micro-particle image velocimetry, PIV) and numerical approaches, including shape-optimisation methods and computational rheology using CFD tools. The small scales typical of microfluidics are known to increase the importance of surface forces and, for non-Newtonian fluids, there is an enhancement of the role of fluid elasticity beyond anything that can be attained at the macroscale. This behaviour, coupled with a significant reduction of inertial effects, leads to new flow regimes in both single- and multi-phase flows, opening a range of potential applications. We focus on the fundamental flow physics, but are also exploring these unique and exciting characteristics to design new microfluidic components, to develop synthetic biofluid analogues, and to enhance and control microscale processes.